A round-up of some of the key addresses and statements issued by republican groups to mark the anniverary of the Easter Rising. Ninety-seven years ago an alliance of organisations, including the Irish Volunteers, Irish Citizen Army, Irish Republican Brotherhood, the women’s movement, trade unionists and Irish language activists, rose up against British rule in Ireland and declared a Republic. Pearse stood here at Dublin’s GPO and read the Proclamation. Six days later, and with the centre of this city in ruins the leaders of the Army of the Irish Republic ordered surrender. In the weeks which followed 15 of the suspected leaders of the Rising were executed, and four months after that Roger Casement was hanged in London. The British hoped that by the speed of their actions and the scale of the executions, that the flame of freedom would be extinguished in Ireland. They were wrong. I am very honoured to be here today in our capital city to honour those who died in 1916 and in each subsequent generation in the cause of Irish freedom. 1916 started a bush fire of decolonisation, which engulfed the British Empire. It inspired generations of Irish Republicans and people throughout the world who rose up against colonial rule. It is a fire still burning in the heart of every Irish republican. Sinn Fein today stands by the Proclamation and for a genuine republic that can embrace the whole island of Ireland and all of its people. Today we remember all those republicans who have died and who gave service in the latest phase of the Irish people’s long struggle for freedom. We particularly remember with pride those from this city and county who decided that they could not stand idly by and watch the injustice and discrimination being inflicted upon nationalists in the North and paid the ultimate price. We send ongoing solidarity to their families at this time. We remember also ALL of those who lost their lives because of conflict. We are proud as Irish republicans that we have played such a crucial role in bringing that conflict to and end. There are many turning points in a nation’s history. The 1916 Rising was such an event as was the Hunger Strike of 1981. Fifteen years ago the single most important political agreement in our time was reached. The Good Friday Agreement continues to deliver day and daily in terms of peace, equality and mutual respect. The Agreement opened up a new chapter in our history in which republican objectives could be pursued peacefully. It levelled the political playing field and changed the North forever. But the Agreement and the Peace Process cannot be taken for granted. While much progress has been made, more needs to be done. Recent events on our streets have shown that. There remain small, unrepresentative minorities within both the unionist and nationalist communities who are opposed to the principles upon which our peace has been built and who continue in their futile attempts to undermine it. They are the enemy of society as a whole and have nothing to offer. Increased dialogue and engagement between republicans and the wider unionist community is vital. We must strive to understand the fears and apprehensions of unionists in 2013. A real reconciliation process is essential in order to create trust between communities. Republicans seek to build such a process but we need partners. Unionist leaders must end the practice of seeking to appeal to the lowest sectarian denominator. There is no future in that. Some supporters of the peace process have commented in recent years that Republican Ministers are in Government sharing power on the basis of equality because we want to be, on the other hand unionist Ministers are in the Executive because they have to be. This approach needs to change. Equality and parity of esteem must be accepted as touchstones for the way forward. Such concepts threaten no community but safeguard the rights of all citizens. The actions of those who have set their minds against change can be seen in the provocation created by the Orange Order’s refusal to engage with residents, the antics of many of those involved in illegal union flag protests, and in the actions of those anti-Peace Process militarists responsible for the bomb in Lurgan yesterday, and other recent armed activity. There are people who dream of wrecking the structures of change. They want to destroy rather than build. Their tools are bigotry, mistrust, militarism and sectarianism. Those who prefer conflict and confrontation must be opposed by political leaders united in a vision a peaceful, inclusive and shared future. Sinn Fein has a vision of a better future. We believe that peace is not merely the absence of war. While the North in particular has been transformed for the better in recent years, the scourge of sectarianism remains. Republicans must be to the forefront in tackling and eradicating this. I believe in the Irish people and I believe in our ability to organise our own affairs. We face difficult challenges ahead but also great opportunities. The British and Irish governments have, in my view, become complacent about the peace process. The continued imprisonment of Martin Corey and Marian Price is an injustice which needs to end. Recently I made representation and gave evidence to the parole commissioners hearing Marian Price’s case. And I believe that the case I made was a compelling one. This week I met with David Cameron in London. The meeting was one of the least satisfactory engagements I have had with a British Prime Minister in the course of the Peace Process. Fifteen years on from the Good Friday Agreement there is an absolute need for both governments to return and honour all of the commitments made in it and in subsequent Agreements at St. Andrews and Hillsborough. The Good Friday Agreement provides for a Poll on Irish unity. Such a Poll provides an opportunity for debate on the future of Ireland. The political geography of the North is changing. Recent census figures show that. Politics across Ireland is in flux. A new Ireland can be what we make it. A Border poll is part of the process of building a modern and dynamic New Republic on this island - an agreed Ireland achieved by peaceful and democratic means. It’s time to let the people have their say. I believe we stand on the threshold of great change. Previous generations have struggled for a united Ireland. But our generation has the best opportunity of achieving it. Ending partition is only one part of building a New Republic. 2013 is the Centenary of the Great Lockout of 1913 here in Dublin. It was an event that showed the tremendous fighting spirit and courage of the working class in this city. They were offered the choice of resignation from their union, the ITGWU, or resistance against great odds. In doing so they prevented the destruction of trade unionism in Ireland and contributed to the radicalisation which paved the way for the 1916 Rising. Today Sinn Fein in Dublin is to the fore in resisting the policies of austerity imposed on ordinary families as a result of failure by governments to curb the excesses of the greedy and the powerful. What would Larkin and Connolly have made of the current state of Irish Labour 100 years on from their historic stand in 1913? There are over 100,000 people unemployed here in Dublin. The only reduction in jobless figures is showing because of emigration, now at levels not seen since the 1950s. That is a national scandal. It is unacceptable and will not change as the current government slavishly follow the disastrous agenda set by their Fianna Fail predecessors. In the Dail, Sinn Fein has put forward realistic and costed alternative proposals that are about fairness. They are about making the necessary deficit adjustment without harming families or frontline services, but by asking the wealthiest to pay more and cutting waste from public spending. Sinn Fein’s focus is on job creation and stimulating the economy. Our approach is based on fair taxes, investing in jobs, debt restructuring and growing the all-Ireland economy. It is about protecting public services and those on low and middle incomes. There are eight Sinn Fein councillors, four TDs and hundreds of activists across Dublin city and county. Our vision is of a New Republic for the 21st century which, like the Proclamation of 1916, guarantees religious and civil liberty, equal rights and equal opportunities for all citizens and cherishes all the children of the nation equally. The new, agreed Ireland we seek to build is inclusive, where all the elements of the Irish nation -- including those in this country who regard themselves as British -- are comfortable, secure and can find the fullest expression of their identity. But we need more people to join with us in building a New Republic based on social justice and equality. Just as our predecessors laid the foundation blocks for the Republic here in 1916, you can play your part in that historic work in the here and now. We are moving forward to the Republic. Join Sinn Fein and play your part in completing this historic task. Sinn Fein National Chairperson Declan Kearney delivered the Easter Speech in Monaghan. The Easter Rising was a huge turning point in the history of Ireland. It represented the beginning of the end for a centuries old colonial status quo. The Proclamation of the Republic set out a new vision which re-imagined Irish society. Even though the Rising’s prospects for success had been eclipsed by the time of its launch, the volunteers carried on, motivated by a conviction that they would set in motion events to bring about Irish freedom. From that point republicanism defined the history of 20th century Ireland. That unstoppable momentum has got us to where we are today. It has been a journey of great sacrifice for successive generations. Monaghan has endured its share of that burden. Throughout the struggle republicans from here have played a central role in the overall freedom struggle. In two weeks the republican family will recognise Monaghan’s special position by conferring the Le Cheile award on Padraigin Ui Mhurchadadh, in honour of the contribution and sacrifices Padraigin’s family have made on your, and our behalf. This August the National Hunger Strike commemoration will be hosted here. That will be a poignant reminder of Monaghan and Cavan’s special links to the sacrifice of the twelve Hunger Strikers during this campaign, and especially Volunteer Kieran Doherty, TD. Yet despite our hardship and heartache, the strategy pursued by these generations of activists to achieve a national republic is working. Today more Irish citizens than ever support Sinn Fein and our strategy to secure national democracy and independence. They do so because it makes sense. Sinn Fein and our policies are relevant to their lives. That is why Sinn Fein is a growing force in this state, and continues to build within communities in the six counties. Sinn Fein offers a real political alternative to austerity, unemployment and emigration north and south. Our strategy has brought about huge change. We pose the only coherent challenge to the forces of conservatism across Ireland. The republican project is about pushing back the boundaries, and not accepting that things must stay the way they appear. We are agents of change. For republican activists there are no limits to what can be achieved. That ambition undermines the status quo and those who seek to prevent change. Therefore, opposition to Sinn Fein’s vision and growth is ever present. That opposition is a reaction against our determination to make even more change across the island. Sections of the old regime in the north and some others want to stop the transformation that is happening all around them. The recent arrests of Sean Hughes and Padraic Wilson, and the street violence orchestrated by some within unionism against the decision taken by Belfast City Council are clear evidence of that. Some still want to try to turn the clock back. They are locked in a time warp. But our direction of travel is set; forward not backwards, towards a new Ireland; an agreed Ireland; a united Ireland. For decades, Irish republicans and nationalists had no alternative to the use of armed struggle against injustice. It is a measure of the success of our strategy that today a united Ireland can and will be achieved by political and democratic methods. The task we have is to persuade and convince all sections of opinion that a new, agreed Ireland offers the best future for all our people. Now it is time for us to re-imagine the future of Irish society beyond the peace process. Sinn Fein’s vision for the future is of a pluralist Ireland, which guarantees the rights of all citizens; an Ireland at peace with itself and rooted in equality. Achieving that will require a new popular momentum arising from engagement, and persuasion and agreement across Irish society. The launch of our Border Poll campaign is a contribution to a national conversation on future constitutional arrangements and economic and social models for the island. Dialogue with other republicans and other national democratic opinion, is an essential part of that process of engagement. Irish republicans share a broad ideological tradition. But not all republicans support Sinn Fein or support our strategy. Some have stepped back from political activism, because of disenchantment or frustration with the pace of change; or for personal reasons. We need to engage with other republicans, especially those who may have become disillusioned. We should not be complacent about their feelings. We should listen to their genuine concerns and criticisms and be responsive. Many have made valuable contributions in the past and we should encourage them to play a positive role again within republicanism. During the conflict some actions occurred which created deep divisions within republicanism. There is a real imperative to try to overcome old enmities, which remain from that period. Regardless of division and past differences, and how these were caused, we should actively promote ideological fraternity across republican and national democratic opinion. British policy in Ireland variously fractured the national unity of the people of Ireland, or held it back by fostering sectarian division through conferred patronage and privilege on minorities. There are two strategic priorities for all genuine republicans and democrats committed to the founding republican doctrine of uniting Catholic, Protestant and dissenter; developing reconciliation, and uniting our people in pursuit of an agreed united Ireland. In today’s Ireland that must embrace, also, people of all religions and none. This represents common ground to be explored and developed. There is also an obvious need for all strands of republican and nationalist opinion to engage with those using militarism to oppose the peace process and republican strategy. Militarism contributes nothing to the achievement of republican objectives. We need, through political discussions, to try to persuade them that continued armed actions will only set back the progress being made towards a united Ireland. Those involved in these groups who may be motivated by patriotic aspirations should instead organise support for their views in exclusively peaceful ways. We must act as nation builders in the tradition of Tone and Connolly. An authentic reconciliation process is essential to advancing the unity of all our people. The hurt and resentments caused on all sides because of the conflict have to be addressed, and healed if possible. Engagement on reconciliation on a cross party and community basis is urgently required. Our party has called for an inclusive national discussion on how to bring this about. There is no alternative to that dialogue. And I would urge other voices from within unionism and across society to make themselves heard. Sectarianism, segregation and division must be eradicated from Irish society and be replaced with a greater cross community resolve. We need to make common alliances with those in the unionist and loyalist community committed to that agenda. There is common ground to be forged in working jointly to tackle the economic disadvantage and inequality in both nationalist and unionist areas and to encourage greater integration. As nation builders we must always look to the future; be prepared to open our hearts and minds to new thinking, new initiatives and new compromises. The unionist community contains diverse opinions, hopes and voices. We should listen to what is being said with open minds and with generosity. All opinions and views are needed to create a discourse for reconciliation in our society. The Irish peace process has been a journey of great change for us all. A new phase of the peace process is now needed. That prospect offers the best opportunity for developing reconciliation on common ground principles between republicans and unionists, and Britain and Ireland. It is the only way for new relationships to form and for trust to grow. We as republicans need to actively persuade to bring that about. We share a collective responsibility to ensure future generations grow up in a better Ireland than we did. An Ireland, which guarantees equality and justice for every citizen, not just some citizens. Ireland north and south faces great adversity but Sinn Fein stands determined to meet the challenges. Republicans have every reason to look forward with confidence. The direction of our strategy is certain, and it guarantees even more change. Next year’s elections present us with new opportunities to do that by electing hundreds of Sinn Fein councillors and a team of MEPs. Republican politics have never been more relevant to the present or the future. Our party is regenerating. New members are joining Sinn Fein week on week. Republicanism has never been stronger and we are poised to become even stronger. We are the new history makers because we are of the people and the people are with us in increasing numbers. Let us continue to popularise the vision of republicanism, give leadership in our communities, and move steadily onwards to a new agreed Ireland of equals. It is an honour to be with you today to commemorate one of, if not the, most important events in Irish history. The 1916 Rising became an essential part of the republican struggle to stem the normalisation of British Rule in Ireland in collaboration with the Home Rule Party. Then and now Home Rule was the preferred option for the colonial power to have the natives administering their rule. Republicans challenged this and the coming together of republican forces that Easter resulted in the flames of freedom being rekindled and the Republic being proclaimed. History shows us the signatories of the Proclamation, our Provisional Government, were executed by the British, however their spirit could not be put down and in the election of 1918 the Irish people upheld the proclamation and on the 21st January 1919 the Irish people declared their freedom and the first Dail Eireann was established. The British parliament refused to recognise the democratic will of the Irish people and through the use and threat of force our great nation was partitioned. Sadly today, after decades of republican resistance and of great pain and loss, so called republican leaders moved to the Home Rule position again and, at the insistence of an intransigent British Government, accepted involvement in a process that did not address the violation of Irish National Sovereignty. Instead they partook in that violation and have sentenced future generations to the challenge of getting rid of British Rule in Ireland. We have taken up that challenge. Two years ago we were assembled here on a windy cold day, Marian Price delivered the oration and afterwards was charged with a spurious claim of holding a piece of paper. She was given bail, however Owen Patterson the British Secretary of State, a man with no mandate in Ireland, revoked her licence and she has been incarcerated ever since. Despite the efforts of the legal system the British Government has refused to show any compassion and are indeed vindictive in their treatment of Marian. Her incarceration is gone past the political process and is indeed a humanitarian issue and yet despite doctors reports that attribute Marian’s severe deterioration in health to the conditions under which she is held, there is no movement from government to secure her release. Marian Price was no threat to anyone, is no threat to anyone and this is recognised when on two occasions through the courts she has been granted bail on the charges against her. We reiterate our call today to release Marian Price now and I call on the Irish people to write and lobby for Marian’s release. Others like Marian and Martin Corey are suffering the same plight at the hands of British Administrators and internment continues. Our call today is to end such inhumane practices, end internment, release all political prisoners and end British Rule in Ireland. Last year we had another dignified and honourable commemoration, a few weeks ago the platform party of last year were arrested and charged with spurious allegations. They were released on bail, however British conditions imposed prevent them from honouring the brave men and women of 1916 here today. We know you are with us in spirit and you know we are fully supportive of your position. The British establishment and British policing in Ireland can try to disrupt our right to honour our dead, they can incarcerate us, harass and intimidate us but they will never suppress the right of the Irish people to be free. These failed foreign policies of the past will not succeed. They failed over the past 40 years of resistance and they will fail now. A couple of weeks ago Martin Mc Guinness alleged he received a death threat from republicans and the message was delivered by British police representatives, the PSNI. Messages between Stormont Ministers and their British regional police force hold no importance or merit with republicans. Mr McGuinness is an irrelevance and a minor distraction to republicans just as he is to unionism and the British government. The spurious threat has more to do with the recent by-election were Mc Guinness was MP and the timing of the claim had more to do with boosting their candidate given the panic that Molloy was not going to make the grade, a fact borne out in the result with a 10,000 drop in the PSF vote. Republicans are not in a civil war mentality and we challenge Provisional Sinn Fein; will you support a challenge to the British Government on their illegal sovereign claim to part of our country or will you be honest and tell the Irish people you violated the peoples sovereignty and effectively are a Unionist party having signed an agreement upholding the British Governments illegal claim? British political policing, the source of the Mc Guinness’ claim, is in tatters from Baggott down, it is in tatters because when they move on the British Agenda on issues PSF don’t like raised they move to the political agenda and back track. They have become political puppets and when they eventually moved on the loyalist/unionist flag protesters they were criticised by the DUP and moved again politically to ease political tensions in Stormont. There is no accountability, the policing Board and the Partnerships are toothless, the political parties have no power and policing remains firmly political. Contrast the treatment of illegal marches in Belfast by the union flag protesters and the treatment of the residents in Ardoyne when they were beaten off the streets. Three months of marches crippled Belfast and the PSNI escorted them safely around the streets of Belfast. Political policing hasn’t gone away you know and the republican/nationalist people here in Derry and across the occupied territory know the full extent of it day and daily and there is not a word of criticism from the compliant political parties and establishment media. The only answer to political policing is to disband the PSNI/RUC, dismantle British policing structures and get rid of Baggott and Co. End British Policing in Ireland. Today it is recognised the lead in upholding Irish Nationality Sovereignty is given by the 32 CSM. This is obvious in the number of republican organisations who now are espousing our position and recognise there is no other issue for republicans. We ask those groups to engage with us in an open and transparent manner regarding the only challenge to the British Governments violation of Irish National Sovereignty at the UN. The issue is not the preserve of any individual or organisation. We have repeatedly said this document is not in our ownership no more than the 1916 Proclamation belongs to any one group. The challenge represents all our thinking and it is for all of us collectively to have that conversation and discussion in moving all our positions forward, just as the leaders in 1916 did in lighting the freedom flame at a time when the Home Rule machine was the greatest threat to our freedom. The challenge at the UN is a clear peaceful alternative in addressing the cause of conflict that wasn’t resolved in 1998 despite claims to the contrary. Today that conflict continues in the absence of conflict resolution. I say absence because the political parties at Stormont having violated our sovereignty cannot admit they failed. Their failure has reduced their capability to bring an end to conflict as their political masters in Westminster wrote their script and based the sham agreement on British terms. The depth of republican thinking has yielded a wealth of visionary ideas for the future well being of our country. But it is essential that our visions for a free Ireland are not used as preconditions against cooperation amongst republicans to secure our peoples right to national self determination. Our core aim is to give our people a free vote to determine their future and they are free to determine what that future should be. We cannot withhold fighting for our people’s sovereignty on the basis that they may not choose an Ireland as we envisage it. The challenge for republicans is to make our vision an integral part of the struggle for freedom and to persuade them that ending the conflict must involve fundamental change in Irish society if a free vote is to mean anything at all. Partition has failed on both sides of the border. Re-inventing partition has failed. Using partition to end partition has failed. Re-naming the institutions of partition has failed. As republicans we first and foremost seek an end to this continuing failure by adopting political strategies which are not compromised by the fatal flaws of the past. And in this task we need the essential assistance of you all whether or not you are a member of the 32 CSM. Together we can move beyond consolidating our position to actively achieving it. The leaders in 1916 achieved it and it is with honour and pride we celebrate and commemorate their brave and honourable stance. We too can take hope from their position and together we can move to an Ireland without British interference. An Ireland that will cherish all of our citizens equally, an Ireland established by all its people in a free vote to determine how we are governed in a post British situation. Let us leave here today with a resolve to addressing the only issue that republicans need to address, the violation of Irish National Sovereignty. Let us do it together. Republican Prisoners, Roe 4, Easter Statement, 2013. On November 21st 2012, Republican Prisoners of Roe 4 announced an end to our dirty protest in opposition to forced strip searching and controlled movement within Maghaberry Gaol. We launched a “unilateral initiative” designed to provide the space required to find an acceptable resolution to the issues affecting Republican Prisoners and in doing so created an opportunity for the prison administration to introduce the necessary measures required to fully implement the August 2010 agreement. We stated that our initiative was genuine and should be viewed as a sincere attempt to create the conditions in which a conflict free environment can flourish whereby all are treated with respect, and dignity is guaranteed. We believe that we have been upstanding in our efforts as Republicans to maintain this. However, over the course of the last 4 months it has become increasingly evident that those in power inside and outside this prison are intent on bringing this process to its knees. Obvious and deliberate attempts to impose their own agendas and destabilise potential progress are constant. We called for a “dialectical process of engagement” aimed at resolving all existing issues but have instead been met with an apparent refusal to work together towards a mutually acceptable conclusion. Any communication that has taken place has proven to be under graded and without substance. The Gaol administration’s lack of willingness to engage with this process in a way that is genuine and effective only further poisons the atmosphere and re-creates the conflict fuelled environment that existed in the past. This is a situation that no-one wishes to re-establish but it should be made clear that Republican Prisoners will remain unflinching in our efforts to create acceptable and humane living conditions within this prison compound. In the period since the announcement of our initiative, there has been no effort by the administration to move forward in terms of creating normality and aiding a solution to the issues that exist. In response to the call for the ending of the degrading and brutal forced strip-searches of Republican POWs we have been met with silence and subterfuge. Those in power have embarked on a time wasting exercise in the guise of applying for a licence and trialling of an x-ray machine. This is both unnecessary and absolutely unacceptable - a fact that has been explicitly and consistently made clear to everyone involved, including all political parties, NIPS, facilitators and David Ford’s representatives in the assessment team. Talk of trialling or bringing in X-ray machines is not necessary or acceptable. There already exists technology acceptable and sufficient that, in conjunction with acceptable searching techniques already in place absolutely caters for the security needs of the prison. The facilitators and David Ford’s own assessment team pointed to this as a solution. We believe that this is still the basis for a solution. Daily life on the Republican wing is constantly overshadowed by problems cultivated as a result of the regime that is currently imposed, a regime that is not in line with that envisaged in the August 2010 Agreement. The culture of controlled movement is a problem that has been recognised by many independent reports into prison conditions, including the Anne Owers report which stated that the regime on the Republican separated unit is “unnecessarily restrictive”. Recommendations were made through the prisoners’ ombudsman office and accepted by the Gaol administration; however changes have never materialised, an all too common occurrence. Republican POWs believe that the structure of any social institution should be devoid totally of violence or force but each day we are faced with the DST (riot squad) operating as landing staff (on Roe 4 only), a group of bullies who are grounded on tactics which are moulded through force and brutality, a trait demonstrated on many occasions in attempts to dehumanise and demoralise Republican POWs; as they enforce their draconian measures upon us at the behest of their faceless, unaccountable superiors. Recent reports and investigations into the everyday running of Maghaberry have confirmed that securocratic elements, including a built in mechanism, designed by and incorporating MI5 is in operation throughout the compound; creating blockages and stumbling blocks for change and progress. The most recent example was when four Republican Prisoners were dragged from their cells/beds by DST (riot squad) and forcibly transferred to another cell on a different landing. After stating that they were not resisting the prisoners were forced to the floor, where up to 8 members of the DST (riot squad) imposed “secure” arm locks and unnecessarily aggressive techniques to fulfill their barbaric orders. These actions prove to be in stark contrast to those envisaged by the Republican POWs when we embarked on our recent initiative and the deliberate re-current practice of non-engagement in regards to these issues is nothing less than a signpost to the failed procedures of the past. These “officers” work as a militia on behalf of the British State, their very existence on this wing is an instrument of brute-force intimidation......designed to break the spirit of the Republican Prisoners, a spirit that cannot be broken. We stand in the face of all that is thrust upon us, we remain committed to the process of change; we will do whatever is necessary to move forward and we will constantly assess our position and alter out tactics/strategies if necessary. It is our belief that the August 2010 Agreement is the basis for the change that is required. However the prison administration must now move in a more progressive direction. Republican POWs are realistic and we are conscious of the growing numbers at Maghaberry as a result of internment by remand currently in practice across the occupied 6 counties. The Republican wing is full at present and there are no available cells. Republican POWs who have been isolated for periods of up to two years and who continue to be incarcerated on the CSU landing; on dirty protest and in lock down for 23 hours per day must be transferred to Roe House. The days of innuendo and false promises are over. We will not stand idly by while Republicans enter this prison and are forced to live in the cauldron of hate and hostility currently imposed upon them. Prison chiefs now need to act. They need to step up to the plate and deal with these important unavoidable issues head on and create the space required to allow all Republican POWs to avail of the separated facilities we are entitled to. On the occasion of the 97th anniversary of the 1916 Rising the Leadership of the Republican Movement sends greetings to all assembled at Irish patriot graves and at monuments to the memory of our Republican dead. Once again we issue a reminder that the centenary of that momentous Easter Week is a bare three years away and we ask who has the credentials to honour that 100th commemoration? Surely not those who accept the British and Unionist Veto on the future of Ireland or those who collaborate with English rule in our country. Their political surrender to imperialism is a contradiction of the 1916 Proclamation and all that it stands for. Preparations for 2016 need to continue. We accept the statement of the Continuity IRA that they abhor drug-dealing and gangsterism and that they have nothing to do with either. We acknowledge their declaration that they remain intact and that their objective is to drive out the British Occupation Forces from the Six Counties just as they were evicted from the 26 Counties by an earlier generation. In short that aim is to complete the work of 1916. We respond to and reject the untrue claim made without contradiction on RTE radio recently that there were no British soldiers in the North. The insinuation is that English rule no longer obtains there. The reality is otherwise. And it is accepted widely that the politically biased policing of the so-called PSNI is nothing but a return to that of the pre-1968 RUC simply dressed up with new badges on their head-gear. We note that the title of Republican Sinn Fein has been misappropriated from it by a tiny splinter group in Limerick. Politicians and a hostile media have given credence to this action by highlighting its misdeeds and then placing the blame on the true Republican Movement. We take advantage of this occasion to clear the air and assert once more Republican Sinn Feins integrity and good name. Similarly, even the name of our country, Ireland, is denied in official circles. The 26 Counties are called Ireland, the Six Counties Northern Ireland and out native land is dubbed the island, thus denying the historic entity which has called forth such service and sacrifice down the years. In this way they seek to deny the very concept of Ireland as our people have known it. They would have us consent to partition and British rule for all time. We say Never. Next year, 2014, will see local elections again in the 26 Counties. Republicans need to make ready and take advantage of openings in this regard. With the abolition of town councils as part of the present administrations policy of centralisation, elections to Udaras na Gaeltachta were likewise terminated. Gaeltacht self-government was an integral part of our EIRE NUA proposals of 1971 making for much stronger local bodies in Irish-speaking areas. Republican Sinn Fein welcomed the limited devolution provided, however, and contested all elections to the Udaras. We see its abolition as a step backwards and deplore its passing. Meanwhile, the new imperialism through a combination of the Euro currency and lack of regulation of banks has brought a seemingly-endless austerity to the ordinary people. The rich get richer and the poor poorer. This process must be resisted at all costs. All the while Republican prisoners in Maghaberry, Co Antrim endure as they seek an end to controlled movement and to strip-searching. Following four months of protest, in August 2010 an agreement was reached. It was reneged on by the prison and resulted in another 15 months of a no-wash protest. Nonetheless pressure has continued on the prisoners and the official prisoner ombudsman has admitted publicly that the Republican wing in Maghaberry is the only drug-free wing in the prison. Internment has been reintroduced as Martin Corey of Lurgan, who had served 19 years and was released, was brought back and has been held again for three years without trial. He is still in Maghaberry jail. 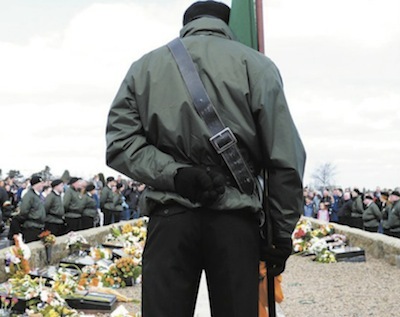 At these Easter commemoration ceremonies we are mindful of the prisoners struggle and salute their sacrifice. An Phoblacht Abu! Long live the Irish Republic!